Glazed pictorial boards. Glazed pictorial unclipped dust jacket, now in removable protective clear sleeve. No inscriptions, 336pp. Clean and bright pages throughout. One of the best books on bread-making with over 200 step-by-step recipes showing you how to make all kinds of bread. 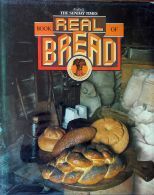 Includes the history of bread making. Contributions fromElizabeth David and Jane Grigson among others. 1.6kg in weight will incur extra postage. (Any digital image available on request).